Staging Canada geese gorge on waste grain. The focus of our mission was clear: Canada geese. But as another flock of 30 honkers looped behind us, jockeying and wafting to align their wings into the wind for a smooth landing in the barley stubble, my thoughts strayed. Oh, I fully expected the geese to finish gloriously -- flaps down and feet stretching for the breakfast table below. I was just as certain few birds in the flock would penetrate the waiting gauntlet of steel shot to my downwind side. As the first flocks of the day proved, a bevy of roaring shotguns and deadeye shooters down the row of blinds left few stragglers in range for those of us on the far end of the line. No matter. I knew as each gunner in a prime position reached the daily limit of five Canada geese, those of us upwind would become more active in the game. Still, I quivered as the dark geese closed the distance, dutifully dropping and coasting into the decoy spread. As shotguns erupted to my left, I too, sprang from behind the doors of my layout blind. But I angled my shoulders to the right -- upwind -- and fired. A moment earlier, a lone drake mallard had settled amongst the goose decoys at the head of the rig. At the urging of the hunt's captain, everyone held fire to allow the circling geese to work into range. While Canadas began thumping the ground downwind, my bead followed the startled greenhead as it hastily took wing. Two blinds upwind, at the end of the line, Ray Blades, a writer for Ontario Out of Doors magazine, had silently decided to enact the same plan. Ba-boom! Together, our two strings of shot brought the mallard back to the black Manitoba soil. Hiding 11 layout blinds in a harvested field of 5-inch barley stalks is an extreme challenge. As we were affixing straw to our blinds in the dark, FA Brand field pro staff coordinator John Vaca and Browning/Winchester Arms shooting promotions manager Scott Grange decided the best set-up strategy was to back into a grassy field edge. By employing several dozen full-body FA Brand Canada goose decoys, Vaca was confident the geese would work to the end of the field rather than land in the middle. Goose droppings smattered the field all of the way to its edges, so setting up on the end of the field to ensure proper concealment of the entire hunting party made more sense than struggling to hide out in the center. "These geese are hungry and have been feeding all over this field," affirmed our host, Blair Olafson of Lake Manitoba Narrows Lodge. "They'll land where you set up." The morning's first honker foretold a pattern. With the sun still fighting to break the horizon, the lone Canada goose circled low behind our row of blinds, then looped to the bottom of the decoys for a final approach. A single volley sent the black-and-gray gander careening into the high weeds. It was an easy, short retrieve. Behind us, hundreds of Canada geese stirred on a bay of Lake Manitoba a half-mile away. Out front, another lobe of the giant lake hosted untold numbers of geese that would leave the watery roost in waves. Some of the geese were undoubtedly local birds, but the majority had spent the summer farther north and had newly arrived to gorge their bodies with waste grain before continuing the journey south to snow-free wintering areas. The first flock of the trip seemingly took forever to square up to land, wavering wildly just beyond the reach of our guns as a daybreak breeze stiffened. They hesitated long enough for another bunch of Canada geese to join a growing cyclone of geese over the field. Just then, a wave of snow geese joined the fray from upwind. Vaca clucked and groveled while 10 more grown men twitched in anticipation below the aerial show. The noisy snow geese passed dangerously close, easily in range for the entire line of gunners. "Let the snows go!" a hoarse whisper demanded. But we had come to Canada for Canada geese. Fortunately, a minute later and 30 yards above a round bale of barley straw toward the center of the field, the two flocks of working Canada geese merged. Better still, the captain of the honker troop gabbled orders for the whole winged squadron to fly into our mess hall for a meal. Down the line, borrowed Winchester Super X3 and Browning Maxus semi-automatics boomed. The lead birds folded quickly, each undoubtedly taking more than one load of Winchester steel shot. Shotguns cycled, and another wad of geese tumbled. I waited. Good fortune: One wayward survivor tried to escape by flying straight into the wind. I swung past its head and fired, but the goose was already dead on the wing when my shot hit its feathers. I'm not sure how many geese fell. Maybe 10. Could have been more. We didn't have time to tally. The next flock was airborne -- locked in on our patch of barley. Unlike the first wave, this batch felt no need to circle. They came in even lower. The guys down the line let the geese get farther into the spread. When Vaca called the shot, I sat up and found a goose crossing directly in front. Feeling the pressure to beat my buddies, I fired fast. Too fast. I missed. But my second try was true. Wave after wave of geese visited our airspace. Most behaved handsomely, lured by decoys, calling and the prospect of tasty waste grain. Two hours after the first shotshell was spent, each member of the group had collected a limit of five Canada geese. A pair of snow geese, two drake mallards and a trio of wood ducks also fell to our guns during an incredible Oct. 1 morning in Manitoba. The sight of 55 Canada geese lined up in rows is impressive, representing a rare and memorable hunt. Closer inspection revealed at least three subspecies of Canada geese in our harvest. The giant Canada class was well represented, with at least a dozen birds in the solid 10-pound to 12-pound range sporting wide wingspans to match. Our take included a lot of mid-sized Canadas, too -- birds with long necks but decidedly smaller than the giants in the pile. The smallest of the lot -- geese barely larger than the mallards we shot -- piqued my interest. The short-beaked Canadas were dressed in darker-gray feathers and had much more stout heads and necks than the other Canada geese we had killed. Known as Richardson's geese or cackling Canada geese, they breed in the Arctic tundra. I shot a pair of cacklers that morning. When one group of six decoyed along with a much larger flock of bigger Canadas, I purposely selected the diminutive geese. As we swept the field to retrieve to our fallen birds, I discovered that John Mullett, a product director for FA Brand, had also focused on the cacklers. "I like cacklers," he admitted. "They're cool birds." To me, the notion of encountering geese that hatch in a land of polar bears, caribou and midnight sun adds a bit of wonderment to waterfowl hunting. Our second morning proved tough by comparison. We set up in high grass pasture, centered in an area surrounded by feed fields and roost water. Although the scouts had found a large concentration of Canada geese using the pasture the previous afternoon, most of the morning's birds seemed headed for other destinations. Bluebird skies and variable winds didn't help our cause. Despite not being on the X, the drawing power of decoys and calls periodically brought honkers to our zip code. Before the bright sunshine halted the morning flight, we managed a respectable 18 Canada geese and a mallard. For my part, I collected three honkers after I volunteered to move with two others to a fenceline a few hundred yards from the main group. We had watched several flocks land just across the fence, so we decided to intercept them as they circled through a gap in the trees. I enjoyed the pass-shooting, but in all honesty, I was anxious to return to camp. The previous evening, I had fired a slug at a black bear -- an animal Olafson was trying to locate as I lay in a field waiting for geese. I volunteered to help in the recovery effort, but the outfitter insisted I go goose hunting with the group. "If you hit him good, we'll find him," he assured me. I was confident in our outfitter's tracking abilities, and I was equally sure I had hit the bear. However, it was my first time hunting bears, so I spent most of the morning second-guessing the sequence. A moment after we arrived at the lodge, Olafson drove a utility vehicle toward us. Behind him, an unmistakable black blob of fur jostled in the bed of the all-terrain vehicle. I smiled. Relief and awe swept over me as my fellow hunters shook my hand and slapped me on the back. For our final morning hunt, Olafson directed us to another barley field. Unlike the field we hunted the first day, the landscape featured neat rows of swathed grain and even standing crops on one side. Hiding the layouts was simple. We burrowed our blinds into a row of cut barley and arranged the decoys around us. All 11 layouts blended perfectly as we waited for shooting light. Once again, roost water was nearby. We could hear restless geese honking in the distance as the day dawned clear. Soon, a pair of Canada geese loomed dangerously low on the horizon. Our decoys sucked them in without so much as a wayward glance. Two simultaneous shots finished the encounter. Within a minute, the next flock closed in. The geese arrived in landing formation, spread evenly across our line of fire, much like we might have drawn it up on a chalkboard had we been designing the ideal scenario. Powder burned and severed feathers fluttered. "Get down! More geese over the trees," was shouted at the men racing to collect the fallen. They came straight on, without a hint of concern. Blinded by barley? We fired, reloaded and fired again. At first, a few hunters were designated as retrievers. But the waves of geese arrived so furiously that after a particularly successful volley, we called a timeout for all of us to fetch our birds and assess our progress. Even as we moved around the field, more geese circled overhead, seemingly agitated that we were stalling their picnic. Incredibly, one flock of four winged overhead and clearly saw a pair of hunters dash back to their layouts, yet still arched around the edge of the field and tried to land in our decoys. We helped all four get to the ground. The experience was much like watching planes at an airport. Without exception, every Canada goose in the air that morning tried to land in our field. I was concentrating on taking photos of the action, so I was the last gunner to collect a fifth bird -- one hour and five minutes into the hunt. Plentiful waste grain and perfect roost waters concentrate geese on Lake Manitoba in late September and early October. The birds are fresh from their breeding grounds and looking for fuel for a long flight south. Compared to most areas in North America, hunting pressure is minimal. Scout, set up and shoot Canada geese -- in Canada. 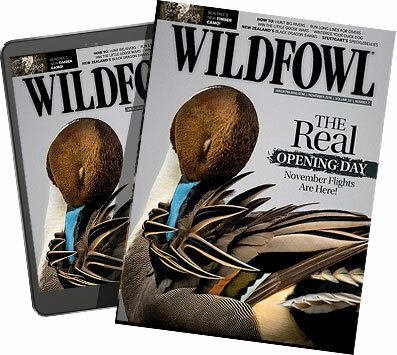 Paul Wait is editor of Wildfowl.